There were no dumpsters and trash pickup back in those days so people carried their trash off into the woods and dumped it in a gully (at least that's what we did!). Of course there was a lot less trash back then. Dump sites on old homesteads can be interesting. As a kid, I would dig around in the one on my Dad's hobby farm. Found an ink well, lots of glass beads, bottles, cracked cups, etc. Kept me out of mischief for hours on end. 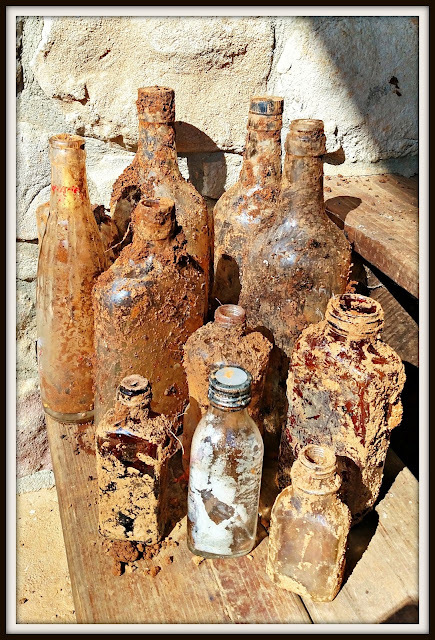 ...bottle collecting is BIG business for some folks.I invite you the share this post at Tuesday's Treasures. Did y'all take a pic of the old homestead before it became history? This makes me wonder what is actually 'underneath' where we all live. This house was built in 1948, hmmmm. What a surprise this is! I can't wait to see them all cleaned up and sparkling. And by then, maybe you will know more about them. This is a pretty interesting find. Looking forward to seeing them cleaned up! Oh wow it's like finding treasure. I hope you find some really cool bottles to keep. how fun! can't wait to find out all about them when you get them cleaned up! Wow, who knows what treasures you might find? Some of those bottles look like they'll be pretty after they are cleaned up. Cool find....but I'm still on the "I have a persimmon tree..."
Blogging friend of mine made a dessert with persimmons and I have been wishing for a persimmon tree ever since! Those are some interesting finds!! Neat! They have quite a patina! so cool! they look in perfect condition. How interesting! I wonder how old these bottle are. I know a while back I learned that town greens were usually dumping grounds for folks. (I'm sure you already know this.) I suppose people, once upon a time, used to bury their garbage--out of sight, out of mind. I look forward to learning more! old homesteads! I collect old bottles and those can be treasure indeed, Lisa..